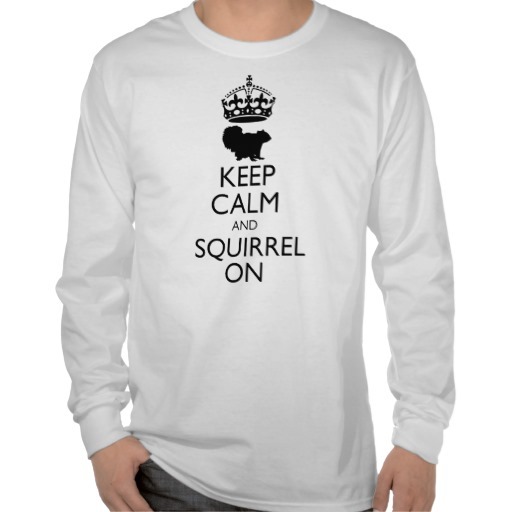 'Keep Calm and Squirrel On' Squirrel Shirt for Men, Women, and Kids. You can buy this shirt here (white shirt), and here (black shirt). Also check out "Keep Calm and Eat Acorns" and "Keep Calm and Eat Birdseed"! A great variation of the "Keep Calm and Carry On" meme, this shirt tells you what you should really do. With a meme that has gone crazy online, it's great to see that there's a variant out there for everyone. A stylish squirrel silhouette under the design's standard crown helps illustrate the point, and adds a little more squirrelly love to the shirt. It's simple, funny tee shirt that's sure to bring a laugh, and it's available in a variety of colors and styles. Also check out "Keep Calm and Eat Acorns" and "Keep Calm and Eat Birdseed"!